Switch on and off some features in the ‘Go Live’ tool. Show a gain knob in order to adjust the gain of the input. Show an output volume knob in order to adjust the output level. Show the main Go Live tool in a minimal size. This is useful if you have many different instances running on your PC. Enable the display of a status Window in the main program. Press the I button to show it when you are in Server View. Show the standard Windows menu bar or a minimized arrow you can click to show the menu-items. If you purchased the possibility to use multiple servers on the same PC, you can enable this. You can also see how many you have purchased. If you experience cross-talk of the return-channel into the signal that is broadcast, tick this. LUCI will then try to reduce this. 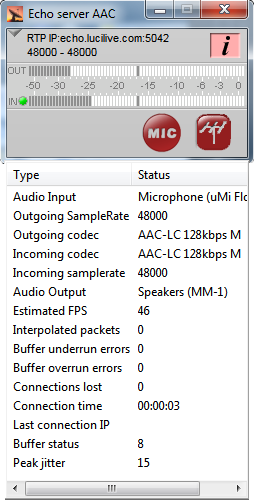 This only works when an external microphone is connected. If you enable this, LUCI Studio will ask you for confirmation when you want to stop the live-stream. If you have LUCI configured as a server (listen to incoming streams) you use this setting to set the time LUCI will keep sending the return stream before it stops and starts listening to incoming streams again. Here you can set LUCI Studio to log what it’s doing, for debugging purposes. If you experience any problems, set this to Normal and LUCI will write a file called lucilog.txt in the folder c://user/you/appdata/roaming/lucilive2/ or in the folder where you started LUCI Studio. Send this file to our support center and also include live2ini.sup from the same folder so we can see what your settings are. 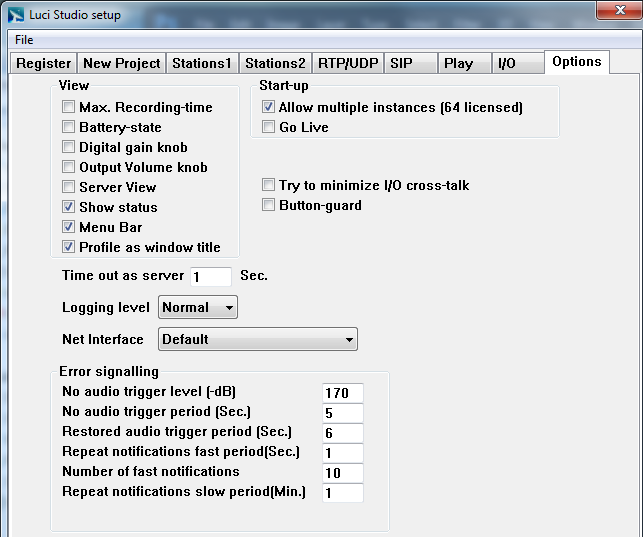 No audio trigger level: if incoming audio-level from the network is below the specified threshold it is considered as No audio. No audio trigger period: the period that the No audio level must be detected before an error conditions is signaled. Restored audio trigger period: the period that the audio must be present before the error condition is signaled as solved. Repeat notifications fast period: after an error condition LUCI will send SNMP traps at a fast rate, you set the rate here. Number of fast notifications: the number of fast notifications to send before a slow rate is used. Repeat notifications slow period: you set the slow notification period here.